To paraphrase a master storyteller*, “It’s been a great week in Kansas City, my home town.” An outdoor jazz concert, a walk through a historic cemetery, and a day trip to Boy Scout camp: any one of these adventures could fill my weekly Postcard. But today I’m clearing the decks, preparing the way for something bigger, so I’ll make do with a summary of each. Jon at Jazz in the Woods. Note the hat and the shade. Smart guy. THE CONCERT: Jazz in the Woods happens every June, and every June Jon and I say, “We’ll go next year.” But this year we packed up a picnic and our kids and went to Jazz in the Woods. I’d classify it as an enjoyable learning experience. First lesson: Our picnic wasn’t welcome. Jazz in the Woods is a charity event that makes all of its money selling food. I’d spent the day making chicken, so we drove across the street to a neighborhood park and ate our dinner before we joined the concert-goers. Later, we bought dessert from the food stands. Second lesson:The hot Kansas sun made me want sunscreen, a hat and shade. The concert started at 5:30. Sundown didn’t happen for three more hours. Third lesson: Live music is a powerful thing. The rich harmonies and undulating beat held us in the moment, all cares suspended, relaxing something deep inside. All around us, the crowd seemed to sink into the experience, unified by a common melody. Remarkable. Next year, we should all go. Meet me there. THE CEMETERY: In May, my book club read The Graveyard Book, by Neil Gaiman. In this story of a child raised in a cemetery, Gaiman incorporates lots of details to give the reader a sense of place. As a follow-up field trip, a few of us explored Elmwood Cemetery in Kansas City, Missouri, founded in 1872. We followed a guide, provided by the front office, and hunted for the resting places of prominent Kansas Citians. The morning air was cool, the sky a pearly gray. Perfect walking weather. Lesson: The size of the gravestone does not necessarily reflect the importance of the person. 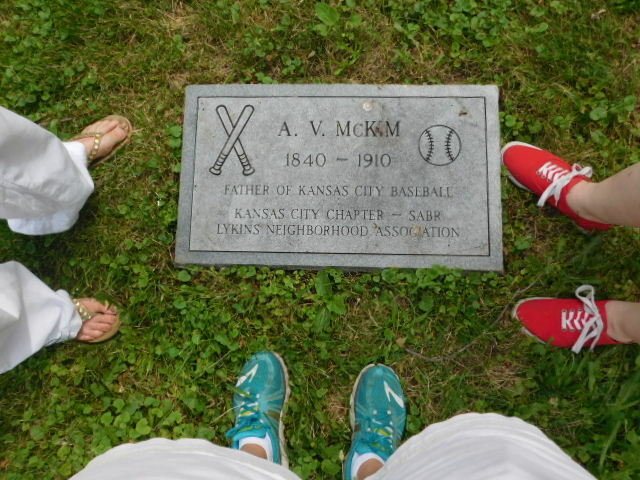 Americus McKim brought Major League Baseball to Kansas City. An important guy with a hard-to-find marker. 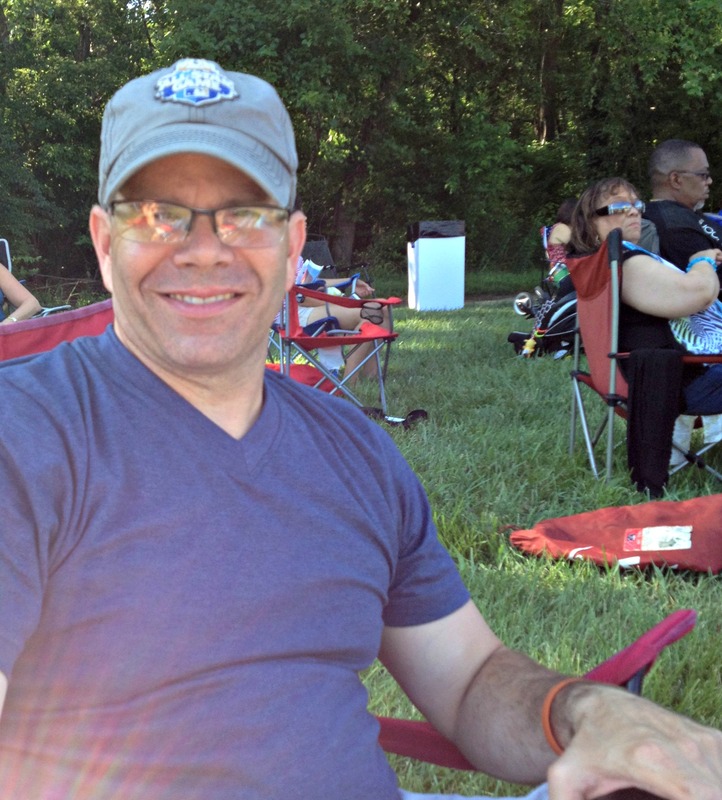 THE DAY TRIP: I took Matt to Boy Scout camp this week. He’ll spend ten days at H. Roe Bartle Scout Reservation on the shores of Truman Lake. Camp Bartle is a beautiful, well-maintained place. Matt’s a lucky kid. Emily rode along to keep me company. The drive down, shared with two other scouts from Matt’s troop, taught me all kinds of things about my children. In fairness to my kids, I’ll keep those lessons to myself. On the way home, we stopped twice. First, we visited the Ico Store. Located outside Camp Bartle in Iconium, Missouri (pop. 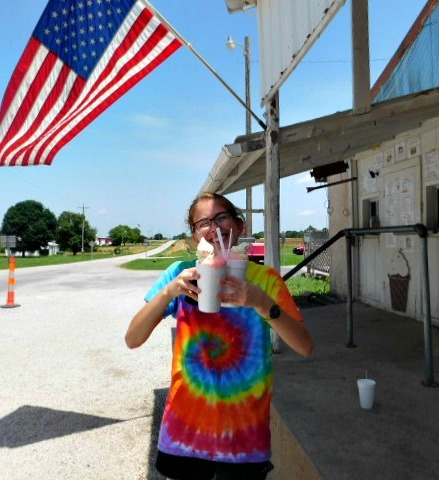 35), the Ico Store is known for its Peach Nehi float, a delicacy among the scouting set. Peach Nehi is not a flavor of pop you’ll find at your corner grocery. Its rarity adds to its charm. Second, we stopped at Upcycled fruit and vegetable store in Garden City, Missouri, outside Harrisonville. We wanted fresh peaches, but they won’t be ready for another week. 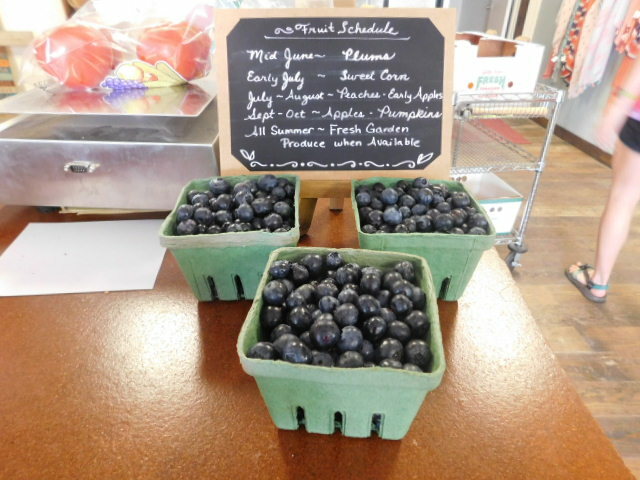 We settled for blueberries, tomatoes, and tiny, sweet plums. I’m glad to know the store is there. Matt’s got a few years left of summer camp. NOW FOR BIGGER THINGS. Next week I’m taking my girls to Iowa. We’ll mosey around on back roads and highways, check out all the destinations I’ve read about, and end up at the Tucker farm for the Fourth of July. Along the way we’re going to visit the Southeast Iowa town that inspired the setting for Lottie’s Gift. When I get home, I’ll have lots to tell. *Did you recognize Garrison Keillor’s stock line about Lake Wobegone? A Prairie Home Companion comes to me live every Saturday night while I’m making dinner. Thanks for the tour, Jane. I would like to go to Jazz in the Woods next year. While you’re in Lottie’s home town, check out any bookstores where you can schedule a booksigning next year ! I have a bookstore on my list, Rebecca. I’m thinking ahead. I’ll also be taking pictures of big Victorian houses. And next year I’ll save you a spot in the shade at the jazz festival.